I’m finding a nice rhythm to capturing ideas before they flit away on the wings of ADD – not just with my crafting but the writing too. Taking a moment to simply sketch a few lines and write a word or two has increased my productivity and sleeping with my journal close by to capture those Giller Prize worthy phrases (lol!) helps too. 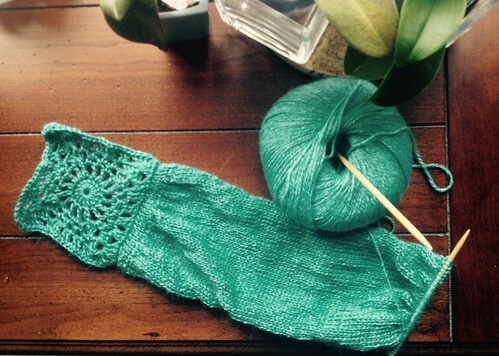 The positive reinforcement of being at my LYS when a customer who’d purchased “Les Cloches Cannelées“, and was at the store for her yarn was amazing! My Bestie works at Yarn Forward, the talented and gorgeous Francine of “Fancy That” and she has been huge in helping get the word out. I’m looking forward to sharing a picture of her scarf when it’s finished. Being there on a day that all yarn was 20% off was inspirational and dangerous. 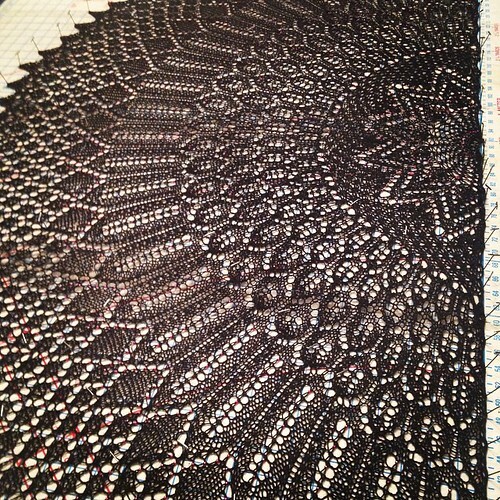 Dangerous to my pocketbook but inspirational for test knitting a combination pattern that’s been percolating. I love crochet almost as much as knitting and often combine the two crafts. This latest idea may make it to a pattern format if all goes well. I’ve begun with a crochet motif and rounding out the idea with knitting. The Berroco “Folio” that I couldn’t say no to, is a treat to work with. Soft, light and warm; it works up beautifully airy on the recommended pins. … as it would seem that over Christmas and Boxing Day, I’ve managed to come down with The Plague. I’ve done nought but sit and blow my nose, listen to audiobooks and when I can manage the needles, knit a bit. I may try to read a real book today, I owe friends from my writing blog some reviews. I hate losing time to illness but there it is. For whatever lunatic reason, I opted to start a project on the 19th December… oh right! 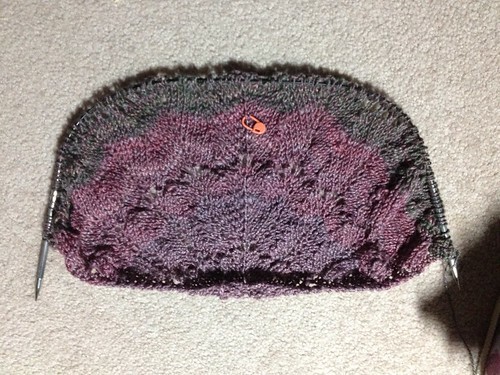 Stymied by a Tunisian stitch on the “Marisol“ cardigan and now waiting for a stitch dictionary. I can’t have idle hands and housework doesn’t count so I began “Revontuli“. It’s a free pattern on Ravelry and has been translated into English. What I looked for specifically was a pattern that would be simple in appearance and use up 241 grams of glorious handspun from Turtlepurl. I’m loving it so far, the picture below shows the beginning though I’ve made it to the end and my planned modification of one full extra repeat before the garter eyelet edge and cast off. It’s become heavy so not sure if I’ll finish today – weak as a kitten and facing with dread a walk to the drugstore for more flu meds. The green has come into the mix and stayed and there is the most subtle of striping effects happening. The yarn itself is glorious, I really love handspun and this is special having been bought direct from Genevieve at The Almonte Fibre Festival, just over a year ago. The fibre mix is such a pleasure to work with, drapey now and with a lovely sheen. The slightly thick ‘n thin thread adds some textural interest. Can’t wait to finish.